When Hubert Tison studied at the École des Beaux- Arts de Montreal , he received his training of artists such as Albert Dumouchel and André Jasmin . In the 60s , after studying in Zurich, London and Paris , he returned to Montreal where he worked at Radio- Canada to make animated graphics for generic programs . He founded the Animation Studio of the CBC , which won several awards and international recognition. He has produced all the films of the famous Frédéric Back , two of which will win an Oscar. Since 2005 , he practiced painting and exhibited in the gallery. Graduate of the Ecole des Beaux- Arts de Montreal , student Albert Dumouchel for engraving and André Jasmin for painting. Fellow Council, he continued his studies for three years in Zurich, London , and Paris . Returning to Montreal , he offers his services to the CBC as a specialist of motion design. He is a Member of the Royal Canadian Academy of Arts ( RCA ) . He established and directs the Animation Studio of the CBC , which has won numerous awards and international recognition. He is the producer and complicit all movies Frédéric Back , crowned with four nominations including two Oscars by the Academy of Motions and Pictures . 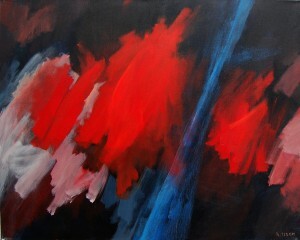 Since 2005 , Hubert Tison made ​​the leap , he chose to fulfill his dream , to leave room for painting. Movement and transparency are very present in what he calls his ” inner landscapes “. I like to let myself be surprised by impressions, color and rhythms that inspire my artworks. I also like the risk to question everything , it is the breath of inspiration. Paintings of Hubert Tison are primarily a poetic transposition of emotions that leaves grow on the canvas. This entry was posted in Biographies, Tison Hubert and tagged Cinéma producteur, Hubert Tison, Tison by chocolat. Bookmark the permalink.